Looks like a great school. I am from Canada, however my sister lives in Anchorage. I have been looking online for a good school. It's hard to find a good tae kwon do school these days. Hey, just found your card. lol. It looks Like your doing well. needs. After observing today, I would like to begin taking lessons. I can't tell you how pleased Rosanna and I are that we picked your Do Jang. Thank you for taking the initiative to volunteer to referee at the last few events. Your dedication to fair and consistent judging is appreciated and has not gone unnoticed. I hope you will soon have some of your own black belts promoted as judges and referees for Alaska's tournaments. I wish you and your dojang all the best. Thank you so much for the two free introductory classes you allowed my son Blake to participate in!! He loved the experience and would like to continue. After school starts I will check back and see how our schedule works out. We will be out of town during your Bar-B-Q and will hate to miss it, Blake especially. I appreciate the study guides. Some video of the forms, sparring and hap ki do would be great refreshers for those who are about to belt test. I will gladly run the camera while Master Ron demonstrates on one of my classmates. 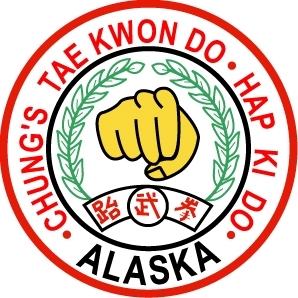 As for Evan Malone's not having seen us at any tournaments, I believe our biggest showing was at the Great Alaska Martial Arts Festival & Tournament last weekend. We had five participants at that fun event. Four of us took first place in our sparring divisions. We did fairly well in poomse with two first place and two second place rankings. We may be a small school, but that is our advantage as Master Ron can give us a lot of individual instruction. I know I have seen significant improvements in myself over the last 6-8 months of training. I figured it was about time to come and visit the site.. considering the fact that I am apart of it. It does look nice and it easy to find your way around, great job on it. I enjoyed looking at your website and pictures of your students. I am hoping for my next belt soon and love the art of Taekwondo. The weather in the islands is much nicer, however, than Palmer. Best of luck to you and the school!